Singapore Cardfight! 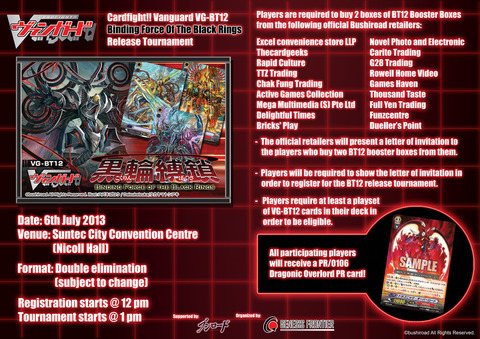 Vanguard Online: VG-BT12: Binding Force of the Black Rings!!! VG-BT12: Binding Force of the Black Rings!!! Buy 2 Booster boxes of BT12 from our shop, Dueller's Point, and receive a letter of invitation to the VG-BT12 Binding Force of the Black Rings Release Tournament!! Players are required to show the letter of invitation in order to register for the tournament. Players are required to have at least a playset of BT12 cards in their deck. And all participanting players will recieve a PR/0106 Dragonic Overlord !!!! So hurry down to our shop when VG-BT12 is available and grab your letter of invitation!! Limited stocks only! !